At Boutique South America, we want you to have a greater experience of the continent than you imagined possible. And given the Galapagos Islands is such a unique destination already, we want to make your ultimate wildlife discovery, that bit better. Introducing the Greater Galapagos Flight Credit Offer for 2018. All bookings on the Galapagos Sea Star Journey in June 2018, will get US$350 Flight Credit automatically. 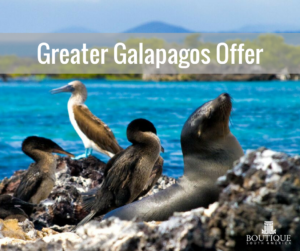 This flight credit will be taken off your flights to and from Galapagos from the mainland, effectively saving you US$350 off your special wildlife program. The Galapagos Sea Star Journey is one of our most luxurious small ships around and has recently been refurbished with all new open air balconies attached to each cabin. These ultra spacious cabins all include orthoapedic beds so you are almost guaranteed a great night’s sleep, attached comfortable bathrooms for your privacy, large windows to let plenty of natural sunlight in, quality linen and a sleek modern interior. No matter where you find yourself, whether relaxing in your room or on one of the many public areas (such ) you can lose yourself in the magnificent views of Darwin’s Pacific paradise. Enquire here, call us on 1300 251861 or email [email protected] for departure dates or to check availability.